The project So Far, So Right is sponsored by the Production Grants to Independent Curators in Visual Arts of National Culture and Arts Foundation of Taiwan. 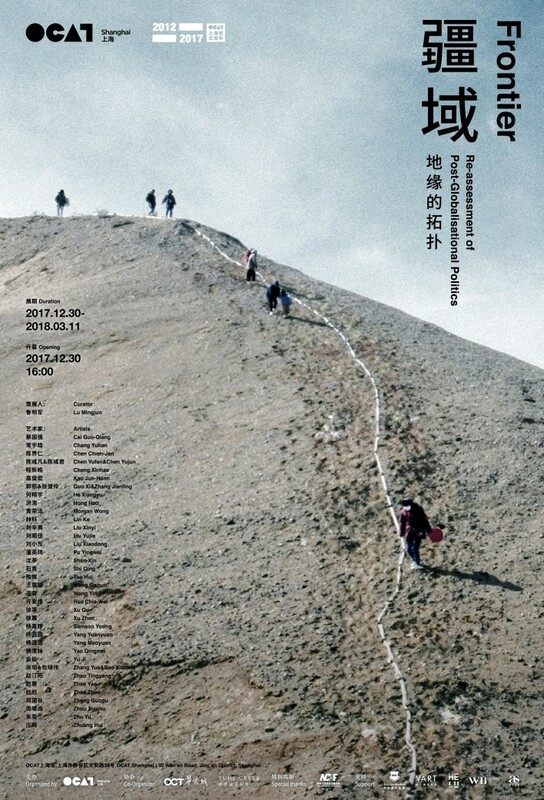 Morgan Wong’s exhibition is partly supported by Arts Development Fund (Cultural Exchange Project) of the Home Affairs Bureau, the Government of the Hong Kong Special Administrative Region. The presence of White Hole, 1979, a short, abstract film by Toshio Matsumoto, at the entrance to the gallery space not only attests to a certain curatorial wittiness (a white hole, in physics, being an area of space-time that matter cannot enter from outside) but also sets the psychedelic tone for the retrospective of this Japanese experimental-cinema pioneer. White Hole examines Matsumoto’s metaphysical quests amid his study of the Upanishads. Such Hindu connections can also be found in Everything Visible Is Empty, 1975, a boldly hued work that consists of meticulously planned intercuts of kanji from the Japanese translation of the Heart Sutra, Hindu imagery, and eventually even planes of pure color—all set to a sound track that subtly evolves from analog South Asian music into those of a pure synthesizer. Matsumoto’s masterful cult feature film Funeral Parade of Roses (1969) is another reference throughout the two-floored show: Excerpts appear in For the Damaged Right Eye, 1968, Ecstasis, 1969, and Expansion, 1972. 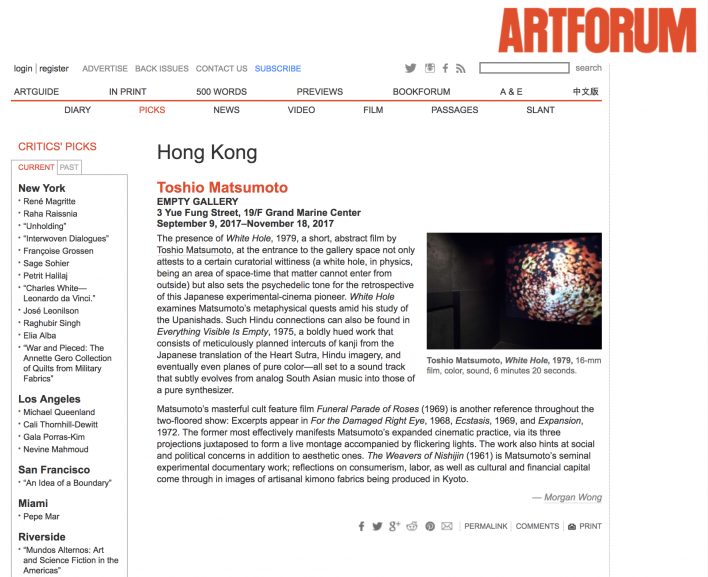 The former most effectively manifests Matsumoto’s expanded cinematic practice, via its three projections juxtaposed to form a live montage accompanied by flickering lights. The work also hints at social and political concerns in addition to aesthetic ones. The Weavers of Nishijin (1961) is Matsumoto’s seminal experimental documentary work; reflections on consumerism, labor, as well as cultural and financial capital come through in images of artisanal kimono fabrics being produced in Kyoto. On entering this exhibition (The State of Emergency I was first conceived in Württembergischer Kunstverein in Germany, 2008) one immediately feels the immense contradiction between the cleanness of the presentation of almost 200 photographs, spread over two floors, and the chaos in Korean social and political issues Noh record. The bottom storey is staged to examine South Korea as an imaginary island and its borders; while on the upper floor, Noh focuses on what he described as South Korea’s own political dark side in last decade, including the impeachment of former president Park Geun-hye. The exhibition design differentiates The 4th Wall: The State of Emergency II from Noh’s earlier exhibitions, including his award winning 2014 Korea Artist Prize exhibition at MMCA. While the majority of works are mounted on the wall, some are attached to poles and choreographed within the exhibition space. These floating imageries remind us of banners held by protestors, and shields used by police or army units, both of which are subjects that appear in overwhelming quantity as subject matter in these works. However, direct confrontation is not always what Noh captures. In Search of Lost Thermos Bottles (2010) shows details of the aftermath – destroyed vehicles, abandoned homes, even a pile of samgyupsal (pork belly, which was presumably being prepared for a meal) covered with ashes – of North Korea’s bombardment of Yeonpyeong Island in 2010. It was South Korean politician Ahn Sang-Soo’s mistaken identification of two burnt thermos bottles as North Korean artillery shells that led Noh on this sarcastically framed journey of foraging. This wit of Noh’s titling continues in the Drought (2015) series on the upper floor. The works not only depict the violence of water cannons firing at demonstrators demanding justice following the 2014 Sewol Ferry Disaster, but also picture the jets of water as if Noh is conducting a study of their formal aesthetics. The Sewol ferry tragedy and its backlash was clearly one of the issues that contributed to the eventual ousting of Park Geun-hye from her presidency. A Chignon Mountain Raised by Lies (2017) captures moments between the end of 2016 and early 2017 in Gwanghwamun Square, at heart of Seoul, where protestors against Park gathered. It was a tough winter through which candlelight not only brought warmth but symbolised will. Here, the faces of protestors are blurred by long exposure. Technique of photography becomes a means for Noh to covey his concept and these images alludes to his critical stance on the politics of photography (echoing sentiments expressed in an earlier series, Criminal Face Collector, 2011 ­– also present in the exhibition). Furthermore, one can hardly ignore the humanistic touch that heightens to the second part of the show in the form of a dramatic lighting shift from fluorescent daylight on the lower floor to warm spotlights here. Not only that, but the long shadows cast by the metal pipes are an awkward reminder of imprisonment: no matter it is Korean labour leader Han Sang-gyun for his convicted role as protests organizer, the six ex-government officials jailed for blacklisting artists or Park over her corruption allegations. Noh uses his lens to guide us through different ways of seeing: from a grand narrative to microscopic discovery; from objective documentation to compassionate expression. Although his works directly relate to specific events in South Korea, there is a universality and timelessness that resonates with an international audience, allowing us to reflect on the socio-political issues faced by other nations.